Fall in love with this MODEL PERFECT, two-story Beazer “Covington” floorplan, nestled on a premium corner lot in the desired Long Lake Ranch community. Full of upgrades! From the moment you enter, you will be impressed with the elegant foyer entryway with chair rail & decorative trim. The great room design with open kitchen and dining area makes this the ideal home for entertaining! The gourmet kitchen with valet area boasts STAINLESS STEEL appliances, 42” staggered Timberlake Espresso-finish Scottsdale-style Maple cabinets with crown, huge granite center island with sink, pendant lighting, upgraded chandelier and a walk-in pantry! There is a half bath for guests. Upgraded 18 x 18” tile! The upstairs master retreat offers room for your oversized furnishings! The spa-inspired master bath features a semi-frameless glass-enclosed shower, listello, luxurious soaking tub, and huge walk in closet! A split bedroom plan with additional secondary bedrooms and bathroom with listello allows for maximum privacy and noise reduction. Upstairs laundry room for added convenience. Added features include paver driveway, a 2-car garage with epoxy floor, upstairs laundry room, and 15x15 caged lanai, large capacity washer & dryer, upgraded landscaping and faux wood blinds. 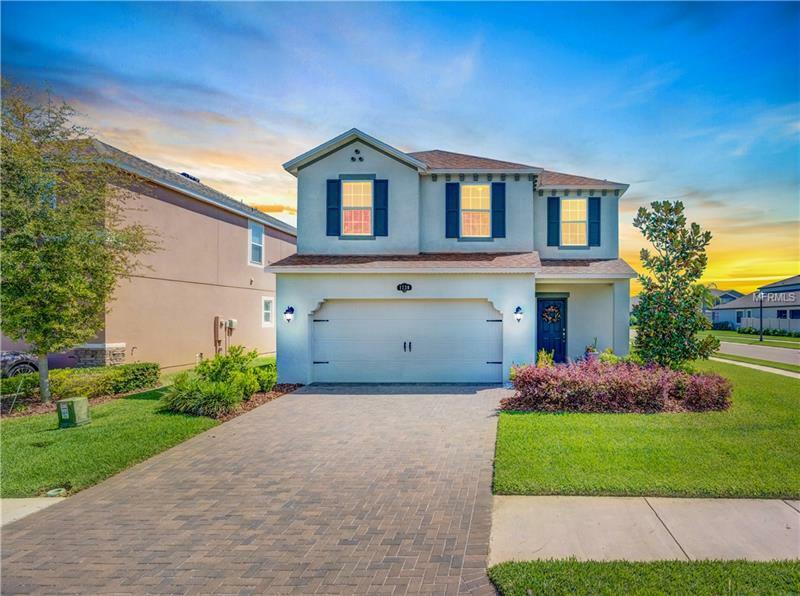 Long Lake Ranch is off SR 54 between the Suncoast Parkway & US Hwy 41.Close to top schools, dining & expressways. Amenities include park, soccer field, clubhouse, resort-style pool, open-air gazebo, playground, dog park, dock, tennis & basketball courts. Pet Restrictions: SEE HOA DOCS. Verify with HOA directly.